Nothing is pressed more earnestly in the bible, than to walk as becomes those called to Christ's kingdom and his glory. By lowliness we understand humility, which is opposed to pride which everyone false. By our meekness, that excellent disposition of soul, which makes everyone unwilling to provoke, and not easily to be provoked or offended. When we find much in ourselves for which we can hardly forgive ourselves, therefore we must not be surprised if we find in others that which we think it hard to forgive. In all faithful of God the Father dwells, as in his holy temple, by his Spirit and special grace. Our great example in this challenge is Jesus. Think of what he had to put up with in his twelve disciples. Remember how transformational was his patience and gentleness with them. 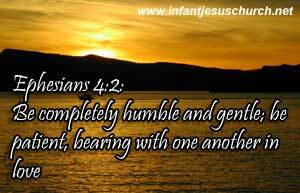 let us meek and humble in all action and practice. Heavenly Father, Give us strength and patience, Loving God, that we may be as loving, gentle and patient with others as our Lord Jesus was with people during his earthly ministry and you have been with us. In the name of Infant Jesus, our Lord we pray. Amen.